Sometimes I realize that I like something so much that I will make it in a strange time of day (appetizer/party food for lunch, anyone?) or go shopping precisely for the ingredients to make it at somebody else’s house so that they can taste it and see if they like it? I did that the other day, well, and then the day after that too. I made these crostini, after talking them up with my sister on our epically slow and bizarrely disjointed black friday shopping (we are not very good at it, I’m hoping this is because we neither of us shop all that often) and how our Aunty Cathy makes it around Christmas, but it’s usually passed out and made in small batches on really teeny slices of bread- it doesn’t usually make it more than 10 feet outside of the kitchen before the plate is cleaned. My point is, I ate these as a late lunch, and then as my friend and I were picking up a few things to make our impromptu Sunday dinner and as I walked by the cheese and fruits section of Trader Joe’s I asked her if she’d ever had pomegranate with brie, she said no, but had recently found out how much she liked brie. Seemed like as good a time as any to introduce her to this. I love pomegranates, but my god, are they messy or what?! It looked like I bled out all over the cutting board (note to self, use plastic cutting board next time…) by the time I was done and I really didn’t spend all that time letting it rest on anything. I made some bread the other day for Thanksgiving, and so it was perfect for this recipe. I just toasted it a little bit, cause it was still fairly soft. Brush it with a little bit of garlicky olive oil, and toast again, to get it nice and crisp. This is one of my favorite flavors of fall and winter, that is an underdog in most menu plans. That and fennel, they seem to not get that much attention. I’m going to try to pay a little more attention to them in the next little while. In a small saucepan, heat garlic, olive oil and herbs until flavor comes out of garlic. Toast bread, brush with oil, until just coated, but not saturated. 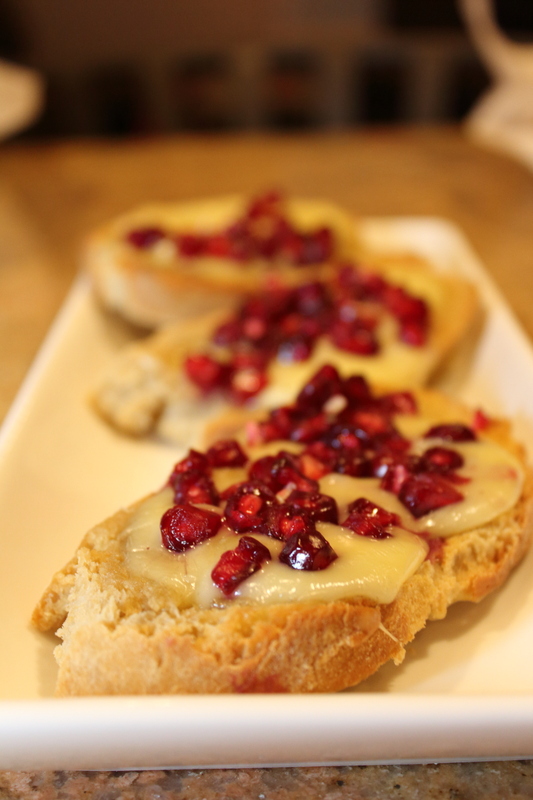 Top with pomegranate and Brie (in either order, I went cheese then pom, but suit yourself) and toast again until cheese is melted. Delicious! You should enter this in the food52 recipe contest, the ingredient is pomegranate, Love how simple and delicious this recipe is. Thanks for the heads up! I’ll go check it out! It’s one of my favorite Christmas eve appetizers. It’s very holidayish for sure. Sounds so good! I entered it on Food52! Thanks again for letting me know about it!